Energetic neutral atoms map by IBEX. Credit: NASA/Goddard Space Flight Center Scientific Visualization Studio. ဟေလီယိုစဖီးယား ဟူသည် နေ၏ဩဇာသက်ရောက်သောနယ်ပယ်ဖြစ်သည်။ဟေလီယိုဆိုသည်မှာ ဂရိဘာသာစကား'နေ'ဟုအဓိပ္ပာယ်ရသည်။ a sort of bubble of charged particles in the space surrounding the Solar System, "blown" into the interstellar medium (the hydrogen and helium gas that permeates the galaxy) by the solar wind. Although electrically neutral atoms from interstellar volume can penetrate this bubble, virtually all of the material in the heliosphere emanates from the Sun itself. The Sun's Corona is so hot that particles reach escape velocity, streaming outwards at 300 to 800 km/s (1 to 2 million mph). For the first ten billion kilometers of its radius[ကိုးကားချက်လိုသည်], the solar wind travels at over 1,000,000 km/h. As it begins to interact with the interstellar medium, it slows down before finally ceasing altogether. The point where the solar wind begins to slow is called the termination shock; then the solar wind continues to slow as it passes through the heliosheath leading to a boundary where the interstellar medium and solar wind pressures balance called the heliopause. The termination shock was successfully detected by both Voyager 1 in 2004, and Voyager 2 in 2007. Beyond the heliopause, where the interstellar medium collides with the heliosphere, it was once thought there was a bow shock. However, data from the Interstellar Boundary Explorer suggests that the velocity of the Sun through the interstellar medium is too low for a bow shock to form. Also, Cassini and IBEX data challenged the "heliotail" theory in 2009. Voyager data led to a new theory that the heliosheath has "magnetic bubbles" and a stagnation zone. The 'stagnation region' within the heliosheath, starting around 113 AU, was detected by Voyager 1 in 2010. There the solar wind velocity drops to zero, the magnetic field intensity doubles, and high-energy electrons from the galaxy increase 100-fold. Starting in May 2012 at 120 AU, Voyager 1 detected a sudden increase in cosmic rays, an apparent signature of approach to the heliopause. In December 2012 NASA announced that in late August 2012 Voyager 1, at about 122 AU from the Sun, entered a new region they called the "magnetic highway", an area still under the influence of the Sun, but with some dramatic differences. The solar wind consists of particles (ionized atoms from the solar corona) and fields (in particular, magnetic fields). As the Sun rotates once in approximately 27 days, the magnetic field transported by the solar wind gets wrapped into a spiral. Variations in the Sun's magnetic field are carried outward by the solar wind and can produce magnetic storms in the Earth's own magnetosphere. The heliospheric current sheet is a ripple in the heliosphere created by the Sun's rotating magnetic field. Extending throughout the heliosphere, it is considered the largest structure in the Solar System and is said to resemble a "ballerina's skirt". နေမုန်တိုင်းများသည် အသံထက်မြန်သောနှုန်းဖြင့် နေစကြာဝဠာအတွင်းတွင်လှည့်ပတ်နေသည်။ At the termination shock, a standing shock wave, the solar wind falls below the speed of sound and becomes subsonic. It was previously held that, once subsonic, the solar wind might be affected by the ambient flow of the interstellar medium: Its pressures were theorized to cause the solar wind to form a nose on one side and comet-like heliotail behind. The area called the heliosheath. However, scientific results in 2009 showed that this model is incorrect. In 2011, it is thought to be filled with a magnetic bubble "foam". Heliosheat(နေနယ်ပယ်အခွံ)၏အပြင်ဖက်၊ နေနယ်ပယ်နှင့်ကြယ်များကြားနယ်မြေတို့ထိစပ်ရာနေရာကို heliopause(နေဩဇာကုန်ရာအရပ်)ဟုခေါ်သည်။ ယင်းသည် နေနယ်ပယ်တစ်ခုလုံး၏အစွန်ဆုံးဖြစ်သည်။ Scientific results in 2009 adjusted this model. In theory, the heliopause causes turbulence in the interstellar medium as the sun orbits the Galactic Center. 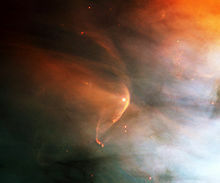 This bow shock, outside the heliopause, would be a turbulent region caused by the pressure of the advancing heliopause against the interstellar medium. However, data from the Interstellar Boundary Explorer suggests that a bow shock doesn't exist because the velocity of the Sun through the interstellar medium is too low for the shock to form. A termination shock in a sink basin. The termination shock is the point in the heliosphere where the solar wind slows down to subsonic speed (relative to the star) because of interactions with the local interstellar medium. This causes compression, heating, and a change in the magnetic field. In the Solar System the termination shock is believed to be 75 to 90 astronomical units from the Sun. In 2004, Voyager 1 crossed the Sun's termination shock followed by Voyager 2 in 2007. Going outward from the Sun, the termination shock is followed by the heliopause, where solar wind particles are stopped by the interstellar medium. The Interstellar Boundary Explorer (IBEX) mission gathered more data on the Solar System's termination shock. Heliosheath(နေစကြာဝဠာအခွံ) is the region of the heliosphere beyond the termination shock. Here the wind is slowed, compressed and made turbulent by its interaction with the interstellar medium. Its distance from the Sun is approximately 80 to 100 astronomical units (AU) at its closest point. A proposed model hypothesizes that the heliosheath is shaped like the coma of a comet, and trails several times that distance in the direction opposite to the Sun's path through space. At its windward side, its thickness is estimated to be between 10 and 100 AU. However, scientific results in 2009 showed that model may be incorrect. ဗွိုင်ယေဂျာ ၁ နှင့် ဗွိုင်ယေဂျာ ၂ ခရီးစဉ်တို့တွင် နေစကြာဝဠာအခွံအားလေ့လာခြင်းလည်းပါဝင်သည်။ ၂၀၁၀နှောင်းပိုင်းတွင်  ဗွိုင်ယေဂျာ ၁ သည် နေစကြာဝဠာအခွံသို့ရောက်ရှိခဲ့သည်။ ထိုနေရာတွင် နေမုန်တိုင်းတိုက်အား သုညအထိကျဆင်းသွားသည်။  In 2011, astronomers announced that the Voyagers had determined that the heliosheath is not smooth, but is filled with 100 million-mile-wide bubbles created by the impact of the solar wind and the interstellar medium. Voyager 1 and 2 began detecting evidence for the bubbles in 2007 and 2008, respectively. The probably sausage-shaped bubbles are formed by magnetic reconnection between oppositely oriented sectors of the solar magnetic field as the solar wind slows down. They probably represent self-contained structures that have detached from the interplanetary magnetic field. Heliopause(နေဩဇာကုန်ရာအရပ်) သည် သီအိုအရ ကြယ်ကြားနယ်မြေသို့အရောက်တွင် နေမုန်တိုင်းရပ်တန့်ရာ နယ်ခြားအရပ်ဖြစ်သည်။ နေမုန်တိုင်းများသည် ပတ်ဝန်းကျင်ကြယ်များမှ ကြယ်မုန်တိုင်းများကိုတွန်းလှန်ရန်အားမရှိတော့ပေ။  ဗွိုင်ယေဂျာ ၁ယာဉ်သည် နေဩဇာကုန်ရာအရပ်ကို ၂၀၁၄တွင်ဖြတ်သန်းမည်ဟုမျှော်လင့်ရသည်။  The crossing of the heliopause should be signaled by a sharp drop in the temperature of charged particles, a change in the direction of the magnetic field, and an increase in the amount of galactic cosmic rays. In May 2012, Voyager 1 detected a rapid increase in such cosmic rays (a 9% increase in a month, following a more gradual increase of 25% from Jan. 2009 to Jan. 2012), suggesting it was approaching the heliopause. Another hypothesis suggests that the heliopause could be smaller on the side of the Solar System facing the Sun's orbital motion through the galaxy. It may also vary depending on the current velocity of the solar wind and the local density of the interstellar medium. It is known to lie far outside the orbit of Neptune. The current mission of the Voyager 1 and 2 spacecraft is to find and study the termination shock, heliosheath, and heliopause. Voyager 1 reached the termination shock on May 23–24, 2005, and Voyager 2 reached it on August 30, 2007 according to NASA. Meanwhile, the Interstellar Boundary Explorer (IBEX) mission is attempting to image the heliopause from Earth orbit within two years of its 2008 launch. Initial results (October 2009) from IBEX suggest that previous assumptions are insufficiently cognisant of the true complexities of the heliopause. LL Ori bow shock in Orion nebula. The star's wind collides with the nebula flow. Infrared image and artist's impression of the bow shock left by the star R Hydrae. The velocity of the LISM (Local Interstellar Medium) relative to the Sun's was previously measured to be 26.3 km/s by Ulysses, whereas IBEX measured it at 23.2 km/s. This phenomenon has been observed outside our solar system by NASA's orbital GALEX telescope. The red giant star Mira in the constellation Cetus has been shown to have both a cometlike debris tail of ejecta from the star and a distinct bow shock preceding it in the direction of its movement through space (at over 130 kilometers per second). However, Voyager 2 crossed the termination shock on August 30, 2007 at 84 AU, showing evidence of denting in the heliosphere, believed to be caused by an interstellar magnetic field. Rather than a comet-like shape, the heliosphere appears to be bubble-shaped according to data from Cassini's Ion and Neutral Camera (MIMI / INCA). Rather than being dominated by the collisions between the solar wind and the interstellar medium, the INCA (ENA) maps suggest that the interaction is controlled more by particle pressure and magnetic field energy density. Newer Model (no tail, bubble shape)This was outdated by 2012, when no bow shock was seen. For a video of the revised no-tail model see here . The new shape from the data is thought more like a spherical bubble, than a cometary shape. ၂၀၀၈၊ အောက်တိုဘာတွင်လွှတ်တင်ခဲ့သော ကြယ်ကြားနယ်ခြားမျဉ်း လေ့လာရေးယာဉ် (IBEX)မှ ရရှိသောအချက်အလက်များအရ revealed a previously unpredicted "very narrow ribbon that is two to three times brighter than anything else in the sky." Initial interpretations suggest that "the interstellar environment has far more influence on structuring the heliosphere than anyone previously believed" "No one knows what is creating the ENA (energetic neutral atoms) ribbon, but everyone agrees that it means the textbook picture of the heliosphere—in which the Solar System's enveloping pocket filled with the solar wind's charged particles is plowing through the onrushing "galactic wind" of the interstellar medium in the shape of a comet—is wrong." "The IBEX results are truly remarkable! What we are seeing in these maps does not match with any of the previous theoretical models of this region. It will be exciting for scientists to review these (ENA) maps and revise the way we understand our heliosphere and how it interacts with the galaxy." In October 2010, significant changes were detected in the ribbon after 6 months, based on the second set of IBEX observations. No bow shock was detected in 2012. Depictions based on outdated scientific model as of 2009. Issues include the heliotail and heliosheath magnetic bubble "foam". In 2012, no bow shock was detected. Between late August and early September 2012, Voyager I has witnessed a sharp drop in protons from the sun, from 25 particles per sec in late August, to about 2 particles per second by early October. 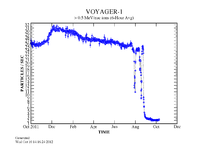 As of June 2012 at 119 AU Voyager 1 detected an increase in cosmic rays. As of May 2012, there is no bow shock, based on IBEX and Voyager data. As of June 2011, the heliosheath area is thought to be filled with magnetic bubbles (each about 1 AU wide), creating a "foamy zone". The theory helps explain in situ heliosphere measurements by the two Voyager probes. As of October 2010, significant changes were detected in the ribbon after 6 months, based on the second set of IBEX observations. As of October 2009, the heliosphere may be bubble, not comet shaped. As of 2008, there is a previously unpredicted narrow ribbon of ENAs. As of March 2005, it was reported that measurements by the Solar Wind Anisotropies (SWAN) instrument onboard the Solar and Heliospheric Observatory (SOHO) have shown that the heliosphere, the solar wind-filled volume which prevents the Solar System from becoming embedded in the local (ambient) interstellar medium, is not axisymmetrical, but is distorted, very likely under the effect of the local galactic magnetic field. ↑ Mursula, K.; Hiltula, T., (2003). "Bashful ballerina: Southward shifted heliospheric current sheet". Geophysical Research Letters 30 (22). doi:10.1029/2003GL018201. Bibcode: 2003GeoRL..30vSSC2M. ↑ Krimigis, S. M.; Roelof, E. C.; Decker, R. B.; Hill, M. E. (2011-06-16). "Zero outward flow velocity for plasma in a heliosheath transition layer". Nature 474 (7351): 359–361. doi:10.1038/nature10115. PMID 21677754. Bibcode: 2011Natur.474..359K. Retrieved on 2011-06-20. ↑ Kerr, Richard A. (2009). "Tying Up the Solar System With a Ribbon of Charged Particles". Science 326 (5951): 350–351. doi:10.1126/science.326_350a. PMID 19833930. ↑ NBCnews.com. "Voyager spacecraft to leave solar system". Retrieved on 2012-10-11. ↑ Lallement, R.; Quémerais, E.; Bertaux, J. L.; Ferron, S.; Koutroumpa, D.; Pellinen, R. (2005). "Deflection of the Interstellar Neutral Hydrogen Flow Across the Heliospheric Interface". Science 307 (5714): 1447–1449. doi:10.1126/science.1107953. PMID 15746421. Bibcode: 2005Sci...307.1447L. Retrieved on 2007-05-25. Schwadron, N. A.; et al (6 September 2011). "Does the Space Environment Affect the Ecosphere?". Eos 92 (36): 297–301. American Geophysical Union.